Trying to do these more often. About a year ago, I made my first backpack for myself. 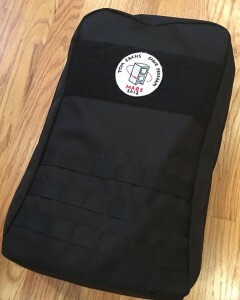 I was sick of my old bags- they were great bags, but they were built for rock climbing or biking or hiking or whatever, and I needed a bag that was built for hauling my daily gear to and from work. So I made one. It was a prototype, and so I made some choices. I made it from 10oz cotton duck cloth, with a lightweight nylon liner. I made the straps unpadded nylon webbing. I reduced features and slimmed it down until it just did the things I really needed. Then I used it for a year. In that time, it’s done pretty well. The top has faded a bunch, and the inside is rattier than before, but it’s mostly held up. I found out that the unpadded straps were awesome (for the loads I was carrying). That the cotton duck was easy to sew but didn’t shed water (duh) and soaked up sweat. That the internal padding wasn’t quite right. That I wanted more pen slots. It was time to make version 2. This time, I sourced some 500d coated Corudra nylon. Most bags of this type are made from the heavier 1000d, but this wasn’t a bag for bushwhacking through miles of thorns- it was for commuting. I did the liner in 420d nylo n, and used a #8 waterproof zipper. I swapped the 2″ velcro loop on the outside to 4″, and added a grab handle to the top. Added some more internal pockets, and spent some more time on the internal seams. It’s about 14.5L in capacity, and it’s pretty lightweight. I wouldn’t want to load it with 25lbs and try to overnight with it- but that’s not what it’s for. If they don’t make what you need, it’s time to build it for yourself. Oh, summer, where have you gone?